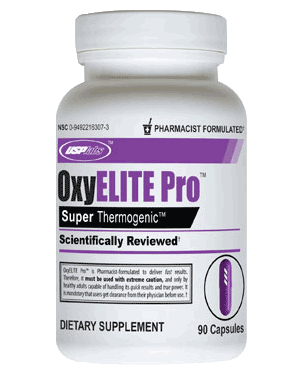 Oxyelite is a common weight loss supplement that is used as a natural fat burner. However, its side effects should be noted before using it. Oxyelite is a weight loss supplement that is intended to be used as a natural fat burner to help users lose weight. Weight loss supplements will not necessarily work the same way for everyone. While the drug can have a significant effect on a person's weight loss abilities, Oxyelite pro side effects may make you uncomfortable. Knowing the risks can help you determine if Oxyelite may be right for you or if it poses an unnecessary risk that is best avoided when you are setting up your weight loss plan. Oxyelite contains six active ingredients like caffeine, bacopa monnieri, bauhinia purpurea, rauwolfia, cirsium oligophyllum, and geranium. These substances help keep the body alert, boost the metabolism, activate the thyroid gland and turn off the receptors that tell the body to store fat. Combining these substances creates a burst of energy that makes it easy to stay active throughout the day. In addition to helping people shed pounds by dropping the added weight that is stored throughout the body, it can help you exercise more frequently to burn fat. You may also find that the same amount of exercise will burn more calories than usual due to the thermogenic properties of the drug. The downside of this formula is that it is filled with stimulants like caffeine that can be dangerous for some users. There is a constant state of arousal present in the body which can lead to Oxyelite Pro side effects in some patient, some of which can be dangerous. It is important to read the packaging on this drug carefully to make sure that you do everything you can to avoid these side effects. You will need to avoid other stimulating products while using Oxyelite as this can cause an overdose-like state in the body which could be dangerous. You will also need to avoid taking the drug in the evening as this can disrupt natural sleep cycles which can lead to fatigue. Not only can this lead to further healthy complications, but a fatigued body is also more prone to weight gain, which will hurt your overall progress. Antidepressants and drugs containing amphetamine should also be avoided while using Oxelite as these can interact poorly with stimulant drugs. Overstimulation - Those who are not used to ingesting large amounts of caffeine can see side effects from a drug like Oxyelite. You may feel jittery or nervous throughout the day. Those suffering from an overexposure to stimulants can suffer from headaches or insomnia as they become used to using these types of substances. Those who suffer from a heart condition or take medication that is meant to act as a depressant especially need to pay attention to the mentioned potential side effects. Heart Trouble - Due to the stimulating nature of the drug, Oxyelite can increase the patient's risk of a heart attack or stroke. The medication causes the blood vessels in the body to tighten, which can be dangerous if it continues for a long period of time. In addition to containing ingredients that shrink the blood vessels, the stimulants in Oxyelite put the body in a permanent state of arousal, which is the physical equivalent of being under heavy stress. Stress will put pressure on the adrenal glands and the immune system, which increases your risk of developing illness. Sweating - Those who experience overstimulation from the ingredients can experience increased sweating. This side effect may not be a bother while exercising as this can increase your weight loss, but this is not the only time when this side effect will become present. You may also notice excessive sweating in moments when it could be embarrassing, such as when you are sitting in a crowded restaurant. Some people have also reported a burning sensation along with this excessive sweating, which can be uncomfortable. Decrease in Appetite - When the body is excessively stimulated, the appetite can be weakened. This can be a positive note for those who are hoping to lose weight, but it is important to keep this side effect in check. Decreasing the appetite below the normal level can lead to the patient not eating at the rate that they should, which can lead to a lack of nutrients in the body. Not getting the nutrition you need while dieting can lead to a loss of muscle in the body, which can put strain on the kidneys as the protein passes through the bloodstream. Reproductive Trouble for Women - Women who frequently use Oxyelite have reported changes in their menstrual cycle as one of the Oxyelite Pro side effects. In many cases their regular schedule has been altered and the bleeding may be more excessive than usual. Some women have reported that the pain associated with their menstrual cycle was greater than usual and that a feeling of restlessness occurred during their period. Using Oxyelite during pregnancy can increase the risk of damage to the fetus or miscarriages. Fluctuating Weight - It is important to note that you will need to monitor how much of the Oxyelite drug you take to ensure that you do not drop weight too quickly. Losing weight at an increased rate increases the risk that the weight will be regained once the weight loss routine stops. If you gain weight back and proceed to use Oxyelite to help lose it again, you can wind up with fluctuating weight levels, which can put strain on your heart and skeletal system.